The head librarian, Siegfried Schieder, is a previous first lieutenant in the German Army. Mr. Schieder has served the USAG Bavaria library, in one form or another, since 1979. GRAFENWOEHR, Germany — Situated on Saratoga Avenue, the library on Tower Barracks is a cozy place for Soldiers and family members to escape from daily routines, study new topics, read — or watch — their favorite stories, and participate in events, such as book clubs and yard sales. The head librarian, Siegfried Schieder, is among the warmest of his highly knowledgeable and passionate staff. 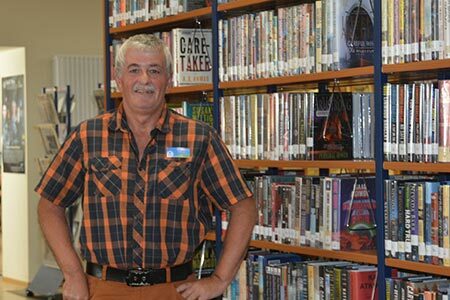 A previous first lieutenant in the German Army, Mr. Schieder has served the USAG Bavaria library, in one form or another, since 1979. Below are his favorite picks. Dante’s Inferno is a classic epic poem about a spiritual pilgrim being led by Virgil through the nine circles of hell. In the Inferno, Dante not only judges sin but strives to understand it so that the reader can as well. One of Charles Dickens’s most fascinating novels, Great Expectations follows the orphan Pip as he leaves behind a childhood of misery and poverty after an anonymous benefactor offers him a chance at the life of a gentleman. Written in 1860, at the height of his maturity, it also reveals the novelist’s bittersweet understanding of the extent to which our deepest moral dilemmas are born of our own obsessions and illusions. The unforgettable, heartbreaking story of the unlikely friendship between a wealthy Afghan boy and the son of his father’s servant, The Kite Runner is a beautifully crafted novel set in a country that is in the process of being destroyed. Anne Frank and her family, fleeing the horrors of Nazi occupation, hid in the back of an Amsterdam warehouse for two years. She was thirteen when she went into the Secret Annex with her family. Her diary remains a beloved and deeply admired testament to the indestructible nature of the human spirit. Winner of the Pulitzer Prize, Toni Morrison’s Beloved is a spellbinding and dazzlingly innovative portrait of a woman haunted by the past. Sethe, an escaped slave living in post-Civil War Ohio, is not truly free, as she is persistently haunted by the ghost of her dead baby girl who died nameless and whose tombstone is engraved with a single word: Beloved. Also part of Army Europe Library’s banned books list. In Winston Smith’s desperate struggle to free himself from an all-encompassing, malevolent state, Orwell zeroed in on tendencies apparent in every modern society, and made vivid the universal predicament of the individual. Orphan Harry learns he is a wizard on 11th birthday when Hagrid escorts him to magic-teaching Hogwarts School. As a baby, his mother’s love protected him and vanquished villain Voldemort. With friends Hermione and Ron, he has to win over returned “One Who Must Not Be Named.” Not all his friends survive massive war. The Lord of the Rings is an imaginative epic depicting the Great War of the Ring, a struggle between good and evil in Middle-earth. In ancient times, the Rings of Power were crafted by the Elven-smiths, and Sauron, The Dark Lord, forged the One Ring, filling it with his own power so that he could rule all others. But the One Ring was taken from him, and though he sought it throughout Middle-earth, it remained lost to him. Elizabeth Bennet’s chances of happiness are endangered by the foibles of human nature in this classic nineteenth-century novel. The life of the English country gentry at the turn of the nineteenth century is made as real to us as our own, not only by the author’s wit and feeling but by her subtle observation of the way people behave in society and how we are true or treacherous to each other and to ourselves.